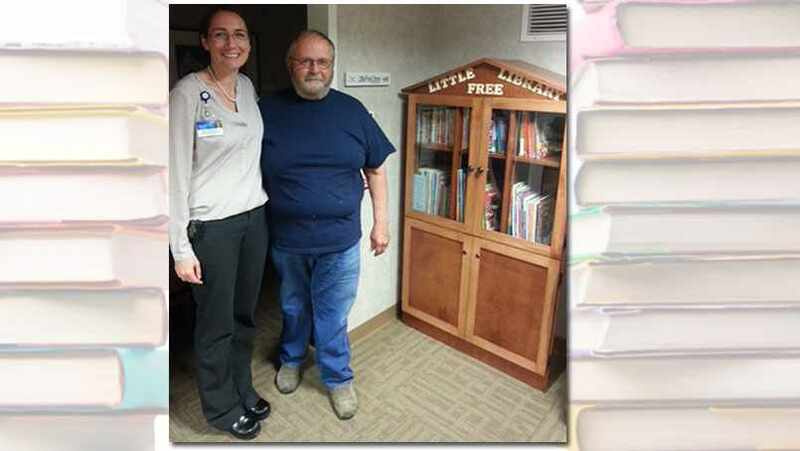 After a successful book drive, staff at Mayo Clinic Health System – Franciscan Healthcare had a good problem: What to do with all those books for pediatric patients and their families? They knew just the guy for the job. Before she retired last December after 45 years of service with Mayo Clinic Health System – Franciscan Healthcare in La Crosse, Wisconsin, Kathy Chapiewsky had an idea. As she started a new chapter in her life, she wanted to leave behind a legacy to encourage literacy among young hospital patients and visitors. So she spearheaded an effort called "Chap's Challenge" that brought in more than 500 books for the medical center's "Reach Out and Read Program." And while that book drive was highly successful, there was one problem, according to Katie Tsigonis, M.D., a physician at the La Crosse–Mayo Family Medicine Residency Clinic. "We had all these books," she says. The question was, "What do we do with all of them?" Dr. Tsigonis remembered that one of her patients, Jim Doerre, was a retired cabinet maker. So, she contacted him, and without hesitation, she says, Jim agreed. Soon he was meeting with Gabe Berendes, M.D., a family medicine resident, to talk specs and design. "Gabe and Jim met, looked at the space in our waiting room, and then came up with design plans together," Dr. Tsigonis says. "And then Jim made this beautiful cabinet exactly to those specs, which we now call our Little Free Library." And he did it, she says, without wanting anything in return. "He volunteered his time and his labor," she says. "We gave him money for the materials, but I know he undershot us by a lot." Jim tells us he looked at it as a chance to help his fellow patients and to have a hand in building something unique. Free Little Libraries have been popping up across the country in recent years. But, he says, "This is the first one that I've seen that's been indoors." Though it may differ from traditional designs, the library Jim built is now officially in the same club as all the others. "We actually signed up to become a Little Free Library site," Dr. Tsigonis says. "So we're technically now on the map with all of the other Little Free Libraries around the country." And that, along with the library itself, has come to mean a lot to Dr. Tsigonis and her colleagues. "From a nurse who was in our system for more than 40 years to a patient helping to make the cabinet — I think the amazing story behind it all has become a real sense of pride for everyone who works here," she says. "It's been a very special thing for us to have here." Jim tells us that's what it's all about. "The patients evidently really like it," he says. "That makes me feel good. I'm glad it's going over so well." You can make us feel good by sharing your comments below and sharing this story with others.